Waukesha’s application to borrow water from the Great Lakes was thoroughly vetted and firmly rooted in science. Still, the topic of drinking water can be emotionally charged, and the passions it arouses can lead to a blurring of the line between myth and fact. In the section below, the Utility would like to address some of the common misperceptions that have arisen about the New Water Supply Program. As always, don’t hesitate to Contact Us if you have questions.. MYTH - Waukesha's use of Great Lakes water will be harmful to the Lakes. FACT – Waukesha’s New Water Supply Program will result in the withdrawal of 1/1,000,000th of 1% of Great Lakes water per day. This is equal to the volume which evaporates from the Great Lakes, on average, every 7 seconds. Most importantly, the same amount borrowed will be treated and returned to the lake as clean water, ensuring no impact on lake levels or water quality. MYTH – The new program's return flow will damage the Root River. FACT – Waukesha’s level of treatment is matched by only a handful of municipalities in the state. The clean water that Waukesha returns to the Root River in Franklin will be higher in quality and have stricter permit limits than existing area wastewater currently being discharged into it and other rivers. The New Water Supply Program will result in a net improvement of water quality in the Root River, and will achieve an increase in base flow volume that has been sought for more than 50 years. In addition to expanding the amount of river habitat and aiding the Root River steelhead egg collection facility, the New Water Supply Program will improve overall fishing and recreation opportunities on this important Lake Michigan tributary. MYTH – Approval of Waukesha's request will set a precedent for Great Lakes water to be sent to communities in California or other far-away places. FACT – The Great Lakes Compact, an agreement between the Great Lakes states that governs water use decisions, prohibits Great Lakes water from going beyond the boundary of counties that straddle the Great Lakes Basin divide. The City of Waukesha is one of a very small number of communities that are likely to ever meet the criteria necessary to borrow Great Lakes water. MYTH - Waukesha can simply continue to rely on groundwater and does not really need Great Lakes Water. FACT – The deep aquifer used by Waukesha and other communities in SE Wisconsin and NE Illinois is severely depleted, due to a combination of over-pumping and a natural formation (a thick layer of shale rock) that restricts recharge of the aquifer from rain and snowmelt. Continued use of this aquifer is not sustainable for the long term. The aquifer also has high levels of naturally occurring radium that exceed federal health standards. MYTH - Waukesha could avoid the need for Lake Michigan water with more conservation. FACT – Waukesha has been a leader in water conservation, and is required by the terms of our approved application to continue efforts in the future. The city's water conservation plan includes a daytime ban on sprinkling, a rate structure that incentivizes conservation, and the first toilet rebate program in the state. We are ahead of schedule on our goal to achieve significant and measurable water savings by 2050. Conservation alone, however, does not eliminate the city’s need for a long-term alternative to the depleted aquifer. MYTH - The purpose of Waukesha's proposal is to promote growth. FACT – Waukesha is already developed, and will see only very limited population growth in the coming decades. Less than 3% of the approved service area is outside the city limits, including 26 acres in Pewaukee that are already served by the city, as well as town "islands" – also currently served – that are surrounded by the city. Waukesha needs a new water supply to sustainably meet the needs of existing residents, not to support additional growth. MYTH - This approval opens the door to hundreds or thousands of additional communities seeking water from the Great Lakes Basin. FACT – Very few communities are even eligible to apply for diversions under the Great Lakes Compact, and even fewer are likely to do so. The Compact bans the diversion of water to any community that is outside the basin, unless it or the county in which it sits straddles the subcontinental divide. They must also prove that no reasonable alternative exists. For the small number of communities that do meet these criteria, the Waukesha application sets a strong precedent for protecting public health and the environment. MYTH - The Compact states that the Great Lakes must be the "last resort" for communities that qualify for an exception. FACT – The Compact says a community within a county that straddles the Great Lakes Basin, like Waukesha, can be approved for Great Lakes water if it has no reasonable water supply alternative. Years of analysis by the City of Waukesha, regional planners, and the Wisconsin Department of Natural Resources led to the consideration 14 water sources, with extensive examination of six water supply alternatives. In the unanimous opinion of the ten Great Lakes states and provinces that reviewed Waukesha’s application, "none of the evaluated alternatives were found to be reliable sources for a long-term, dependable, and sustainable public water supply." MYTH - It’s unusual for a municipality to discharge to a river. 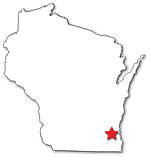 FACT – About 473 – or 94% – of the approximately 500 municipal wastewater treatment plants in Wisconsin flow into rivers. Of those that do not, 22 flow directly to the Great Lakes and 8 flow directly to inland lakes. Federal and state regulations protect water quality and communities that are downstream from municipal discharges. (In fact, Waukesha itself is currently the beneficiary of such protections, as two municipalities discharge into the Fox River upstream of the city.) Only a handful of communities in Wisconsin have treatment processes as advanced as those at Waukesha’s Clean Water Plant, thus ensuring that return flow into the Root River will meet or exceed all permit limits. MYTH - The deep aquifer is recharging, and has risen enough to be a sustainable water supply for Waukesha. FACT – While groundwater levels have recently shown a short-term rise, area communities withdraw water at a faster rate than the aquifer recharges. The historic long-term trend shows consistent depletion of the deep aquifer over time, despite temporary rises in the groundwater levels due in part to reduced demand and the decision by some communities to switch their supply to surface water or the shallow aquifer. The water level has dropped more than 350 feet over time, and independent hydrogeologists from the Wisconsin DNR and the US Geological Service do not foresee a significant reversal of this depletion until Waukesha begins accessing its new Lake Michigan water supply.